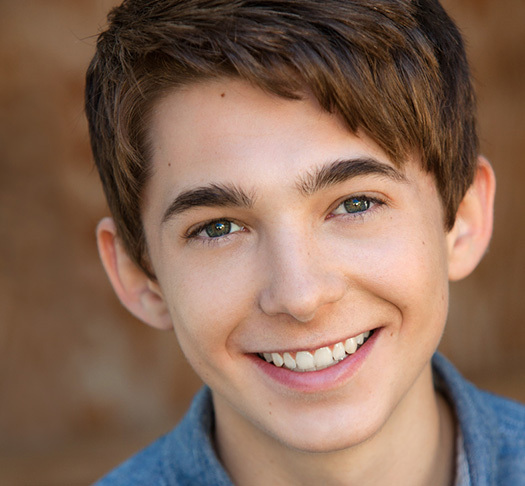 In just a few short years, Austin Abrams has gone from playing Chip in a dinner theater production of Beauty and the Beast at age eight to appearing in films alongside big name stars like Ryan Gossling (Gangster Squad), Cuba Gooding Jr. (Ticking Clock) and Jennifer Love Hewitt (Jewtopia). Earlier this month the 16-year-old actor from Sarasota, Florida, made his Sundance Film Festival debut on a new movie called Toy's House. The film also stars Alison Brie, Mary Lynn Rajskub and Megan Mullaly. Austin's character Aaron is a nerdy kid who sets off with two friends to live in the woods after getting fed up with life at home. In a recent one-on-one interview, Austin told us, "I wanted to mix it up a little bit so I made him nerdy-ish but trying to be cool." But off-camera, Austin is not like that, "Essentially I'm different from him because he's trying to be something else than he actually is and for the most part I try not to do that." The movie has drawn comparisons to other coming of age films like Stand By Me and The Goonies. Austin says noting the similarities is fair. "It has the same kind of vibe, but it's filmed different. It's filmed in a more artistic way. But the comparisons are accurately made." The young actor said there was a lot of improvisation on the set and recalled, "They are all really fun people and they are all really creative. It was really amazing to have such creative people in such close proximity to each other." But this is not the first time Austin has worked with creative, talented actors. He can also be seen on screen in the film Gangster Squad starring Ryan Gossling, Sean Penn, Josh Brolin and Emma Stone. Austin remarked, "Working on that film with Ryan Gossling and David Fleischer was awesome. It was a really great learning experience to watch these people work. It was a privilege." What lies ahead in Austin's future remains to be seen but he plans on acting for a long time. In ten years time he said, "There's nothing else that I want to do. I hope I'll still be acting and improving as an actor." And so he plans to go to school to study more. He may go to UCLA and learn bout directing and the business side of filmmaking or he may go to London to study acting more in depth. Both plans have one goal in mind, "Trying to get better as an actor, trying to improve." When we asked Austin which pop culture icon he would be for a day, his answer, the Beatles, was a bit surprising, considering he only dabbles in guitar playing as a hobby. But his explanation all made sense given his intense goal to improve as an actor. He explained, "I remember watching an interview and Paul [McCartney] said, 'If we can't hear ourselves, how can we get better?' And that comment really struck me because the Beatles at that time were at the height of their career and they could have just kept going singing poppy songs about girls. But they wanted to branch out and improve and that was a big inspiration… Usually you don't see that a lot. People get really good and they're just like, 'Well, I'm here. This is it. I'm really good. This is it.' I suppose they didn't see it like that and that was really cool." Watch for big things from Austin starting with both Toy's House and Gangster Squad. Check local listings for theaters and showtimes.